Nearly a decade ago, in the catalogues for his exhibitions, Qiu Zhijie began to plot out intricate maps of the relationships among his various artworks. It was from this synthesis of research, writing, imagination, and action that the “Mapping the World Project” was born. In the hundreds of maps that have followed, the ink and brushwork of landscape painting outlines a coordinate system which condenses ideas, individuals, objects, incidents, and situations, weaving them together, and offering a possibility for understanding them in relation to each other. The intelligently schematic nature of these maps has allowed them to serve as blueprints for various exhibitions, notably the 9th Shanghai Biennale, which Qiu curated in 2012 on the theme of urban regeneration, and the recent Guggenheim survey “Art and China after 1989: Theater of the World” (2017-2018) for which he created a monumental map that connected the works, artists, and historical milestones covered therein. 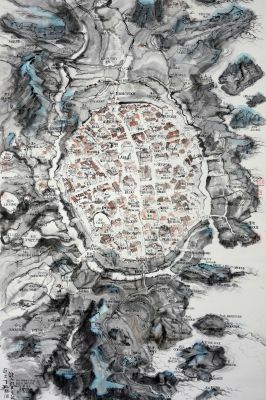 Qiu’s maps also exist as discrete artworks, created in series including the “All of the Objects Series,” “All Living Things Series,” “Autobiography Series,” “Narrative Map Series,” “Spatial Map Series,” and “Action Map Series,” always keenly aware of their subjective, constructed nature. For the last ten years, mapping has served multiple functions in Qiu’s artistic practice: as self-conscious gesture, workflow chart, exhibition plan, intellectual exchange, political topology, and cultural research programme. These maps ultimately reflect the myriad identities of their author: artist, educator, curator, theorist, and eclectic cartographer. Qiu Zhijie (b.1969, Zhangzhou, lives and works in Hangzhou and Beijing) graduated from the printmaking department of China Academy of Art in 1992. He currently serves as dean of the School of Experimental Art at China Central Academy of Fine Arts and professor at the School of Inter-media Art at China Academy of Art. His major solo exhibitions include “Journeys without Arrivals” (Van Abbemuseum, Eindhoven, 2017); “Qiu Notes on the Lantern Festival Project” (Museum of Contemporary Art of CAA, Hangzhou, 2015); “The Unicorn and the Dragon” (Fondazione Querini Stampalia, Venice, 2013); “Qiu Zhijie: Twilight of the Idols” (Haus der Kulturen der Welt, Berlin, 2009); and “Qiu Zhijie: Breaking through The Ice” (UCCA, Beijing, 2009). Recent group exhibitions include “Art and China after 1989: Theater of the World” (Solomon R. Guggenheim Museum, 2017-2018); and “Bentu: Chinese Artists in a Time of Turbulence and Transformation” (Fondation Louis Vuitton, Paris, 2016). He has participated in the Gotenborg Biennial (2013), the China Pavilion of the 48th Venice Biennale (2013), the Yokohama Triennial (2005), and the Sao Paulo Biennial (2002, 2014). His curatorial credits include: “Image and Phenomenon,” China’s first dedicated exhibition of video art (Hangzhou, 1996); “Post-Sense Sensibility,” a landmark series of underground exhibitions between 1999 and 2005; the 9th Shanghai Biennale (2012); and the China Pavilion of the 57th Venice Biennale (2017).